Julie Hare works for KPMG. In the first seven months of this year, a staggering 685,000 international students came to Australia to study. About half headed to university to study for undergraduate and postgraduate degrees, most often following on from an intensive English-language course. That’s 82,000 more students than the same time last year – a 15% increase. In stock market parlance, that’s a bull market. The Australian Bureau of Statistics (ABS) recently calculated the economic impact of this influx of students was A$28bn in 2016-17. This was a A$4.4bn boost on its earlier estimation, thanks to a change in methodology that included interviews with departing students in airport lounges which better captured their spending patterns and visits from family and friends. Australia should be justifiably proud of the fact it is the third largest destination for international students after the US and Britain. It has by far the largest proportion of overseas students enrolled in its universities – nearly 20%. That’s an average of one in five enrolments. However, enrolment patterns are not evenly spread. While it’s boom time for the small numbers of public universities and private colleges able to capitalise on the incoming tide of newly middle-class students from China and India, others struggle to keep their heads above water. 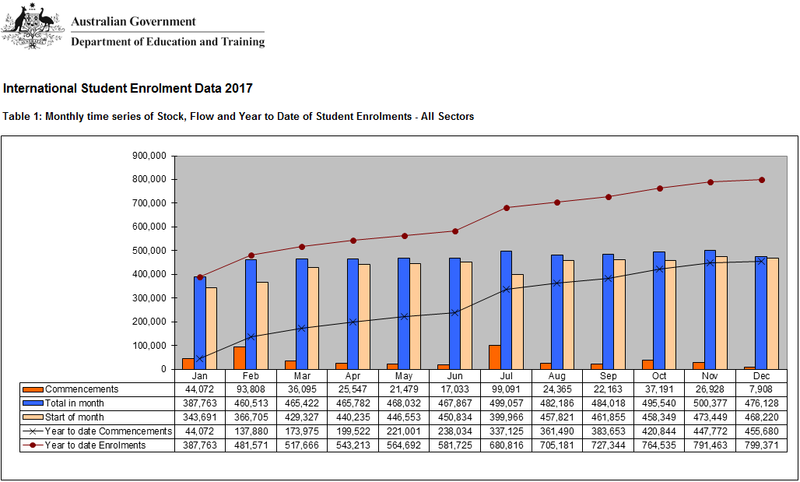 Federal government data neatly paints the picture: in 2015, the Ballarat-based Federation University had the highest proportion of international student enrolments, sitting at 42.5%. However, almost all of them study in high-rise glass campuses in the Melbourne CBD. There were another six universities with international enrolments exceeding 25%. All were in inner city Melbourne and Sydney. Only 10% of inbound students go to regional areas, while Sydney and Melbourne between them attract 65% of all international students. Earlier this year, the Committee for Perth published a report bemoaning the fact that Western Australia was failing to capitalise on the boom, and had even witnessed a decline in enrolments over the past 15 years. To compound matters, half of all WA’s international students were enrolled in offshore campuses, particularly those in Malaysia, Dubai and Singapore run by Curtin University. But why? Surely WA has time zone, cost and lifestyle advantages compared to other states. Reasons for a lack of interest in studying in WA are unclear. Chinese students are particularly disinterested in Perth and surrounds. They may make up one third of all the students heading into Australia for study purposes, but the Chinese account for a relatively low 13.8% of WA’s international student cohort. One concern is that the concentration of international students in inner city Sydney and Melbourne is clogging infrastructure, adding to house and rental prices and causing ghettoisation in some residential areas. To make matters worse, regional universities keen to get their slice of the action have started establishing high-rise glass tower campuses in the inner cities adding to rising pressures. A recent report from property analytics company CoreLogic found that 65% of Melbourne CBD residents were not Australian citizens. In Sydney’s Haymarket the percentage was 54%, while in Clayton and Carlton in Melbourne the figure hovered around the 50% mark. A total of 17 other suburbs in Sydney and Melbourne, along with a smattering in Brisbane, Perth, Adelaide and Canberra postcodes, all had transient populations in which non-Australians, namely international students, comprised over 35% of the residents. The question is why. Accommodation in our inner cities is exceptionally expensive even by world standards, giving unscrupulous landlords license to exploit the unaware. A 2016 University of Technology Sydney report for the City of Sydney agreed. It also pointed to expensive public transport, the fact jobs are hard to come by (and international students are limited to 20 hours a week) and cultural naivety, which leaves many vulnerable to exploitation. There is little, if any, integration with locals. The report cites alcohol abuse, gambling, sexual and mental health issues, which often go unreported, as barriers for well-being. On the upside, our inner cities are regarded as safe, despite spates of attacks on international students, such as those in Melbourne in 2008-09 and again in 2016. The challenge now is to ensure the boom in student numbers isn’t undermined by bad experiences and lack of capacity. Marketing and messaging is important for attracting international students to Australia, but we need to encourage them to look beyond the two main cities. The glamour of tourism tends to catch politicians’ attention, but international education is largely left to fend for itself, despite the economic flow on impacts. What is needed is a real, coordinated, practical, focused and strategic oversight of this enormously important sector to ensure its reputation and financial health into the future.